Rainbow Puddle is delighted and honored to have been asked to contribute to the visual effects in the Broadway presentation of "Fela." Liquid Light is beautifully spread across the stage and projected throughout the house in two production numbers! Great play, with awesome energy (dance and song), that backs a great story and subject line! Music Writers & Rock Fans: You've heard his drumming for years! Can you help get Gary Chester recognized for his 15,000+ studio sessions and inducted into the Rock Hall of Fame! Visit Gary's new website. WHERE is Kate Grady SF, Larry Rothschild, Jane Gold, & Sue Seibel (NYC) or Larry (Lawrence D.) Smith (PA) ? That you? Know them? Please click names and be in touch. Also, anyone at (Hawthorne Cedar Knolls) HCKS 1963- 64, Donna Tribideaux, etc. please email me. These pages are dedicated to all light artist wizards whose visions lit a path to our creativity, and of course the chemicals themselves that lent us those magnificent lenses and peripherals to see our own visions more clearly. And finally, to you, the end user of these pages. Enjoy. 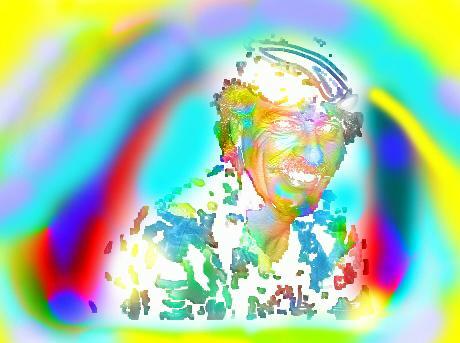 This page & others created by Just Another Nobody ~@~ CopyLeftCenterRight © 1999 - 2011 & Beyond, Rainbow Puddle & NoBody; maintained and developed by Phoenix (aka VJ Rainbow Puddle), the artist formerly known as Hal.